VERY few people can imagine their daily life without digital gadgets, which have already turned into the best friends and have become absolutely irreplaceable. People are used to comfort and expect to find it wherever they are. Social media platforms were developed to connect friends who are distances apart. Internet was developed by US Army for the primary purpose of having a defense network that could function in the time of a nuclear war. But later the technology was used on other platforms and now is the global computer network providing a variety of information and communication facilities that become everyday use and provides daily reliance of things. Blockchain is then a growing list of records on the internet, which are linked using cryptography or cryptology. Cryptography is then being understood as the practice and study of techniques for secure communication in the presence of third parties called adversaries or enemies. So blockchains which are readable by the public are widely used by crypto currencies or virtual currencies. Bitcoin is one example of a virtual currency or crypto currency. Blockchain was invented by Satoshi Nakamoto in 2008 for the use in crypto currency or virtual currency and is a medium of exchange using cryptography to secure transactions and to control the creation of new units. Satoshi Nakamoto sounds like some Russian name but in fact is not the name of a ‘real’ person but is a name used by an unknown person or a group of unknown people who developed Bitcoin within the Blockchain. Crypto currencies are a division or subsets of alternative currencies, or specifically of digital currencies. Bitcoin become the first decentralized crypto currency in 2009, a year later blockchain in 2008. Since then, numerous crypto currencies have been created and are still creating. One might wonder why crypto currencies are continuously being created. Well, think of it in fiat currencies or banknote currencies of each nation. Fiat currencies are created and distributed to aid the ancient barter system within a calculated geographical location under a sovereignty or autonomous governance or control. As it is circulated within a confined system, the fiat currency is issued, centralized and controlled by the administration and its bank. So fiat currencies are created and issued by the administration which is usually a government while crypto currencies are created by computers and stored in a public database (blockchain) and are decentralized meaning crypto currencies are not owned by one entity like a bank or an administration. In Papua New Guinea society, we define the traditional barter system by practice and our way of life. For example in the highlands, the traditionally ceremonial barter system is called Moka in Western Highlands where exchanges of goods for goods take place, pigs and kina shells were exchanged during the Moka ceremony. In one Western Highlands society, the word is Moka, and to the rest of Papua New Guinea there are about different 840 words which each describe the barter system better within each different linguistic group, tribes or ethnical groups where we come from. So in a way, it is that simply and easy for blockchain technology and its crypto currencies to be adopted into our society as were already been living in a communal society – a society conducive for crypto currency and blockchain to breath. PNG Government is very keen to adopt the blockchain technology into the government system, with the Central Bank of Papua New Guinea is lobbying to have use blockchain to cater for a majority of the 8-million people are not into the banking system and use blockchain for financial inclusion. Recently, NCD Governor Powes Parkop was supporting a blockchain technology event to hold in Port Moresby. The Governor believes that this breakthrough and disruptive technology is a vital stepping stone in the country’s development. “Blockchain Technology is taking the digital world by storm with its applications in digital currencies, ledger structures, decentralized identity, markets, and basically any working system or information that can be stored and operated via this decentralized database,” Mr. Parkop said. “The application of this technology in systems of governance and service delivery throughout Papua New Guinea will provide levels of efficiency and transparency which are currently desperately lacking in the country,” he added. 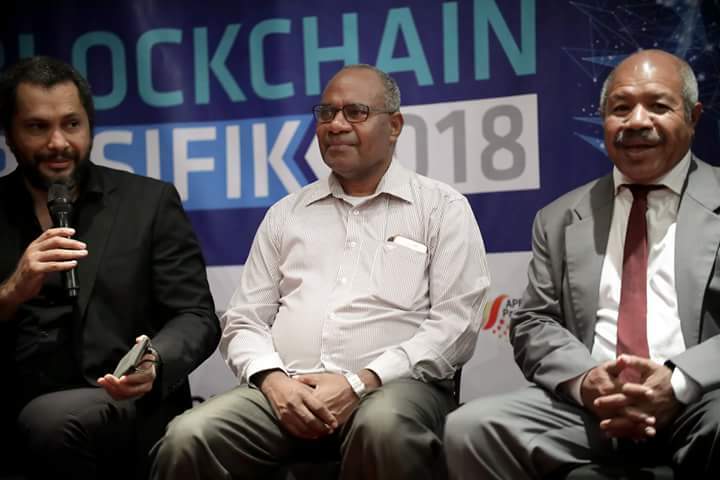 Blockchain Pasifik, a Port Moresby-based entrepreneur cluster, is hosting the event from 11th to 12th October is looking to bring together experts in fields ranging from banking and digital commerce to combatting corruption, from PNG and abroad to the nation’s capital in a two day event which will formally introduce Blockchain technology and its many benefits to Papua New Guinea. The Blockchain Pasifik team is comprised of local Papua New Guineans headed by Rex Paura who is a co-founder of Con-Sure, a Port Moresby-based 100% nationally owned local insurance company using the blockchain technology platform. Blockchain technology is such a disruptive technology that will change the world how we do things. Banking is the first industry blockchain has tapped into and gradually moving out to other industries. The areas that blockchain will impact or is impacting are financial services and banking, publishing, real estate, healthcare, music, government, insurance, charity, digital marketing, job marketplaces, crypto currency exchanges and more coming on board. In the Digital marketing area, tourism industry has found itself in there. Every other industry is tied to the travel industry and thus blockchain impacting other areas will come to tourism sector. Throughout the world there are so many projects on tourism and blockchain. Deskbell Chain is a blockchain platform of tourism and hotel industry. It is a blockchain-enabled platform of socialization, marketing of hotel and travel businesses as well as offering flexibility in check in time for customers in a hotel setting. The lesson here is, in whatever industry financial mechanisms favor one party over the other, blockchain can come in to equalize the system and ensure that everyone gets their fair cut. It has the key to increase the average number of guest checking in thus remains the best digital strategy for a modern hotel. Blockchain which enables hotels to get out important information to the guests and keep communication with them via chat. What is more, it also sells the site to promote their services. For tourists, DeskBell service serves as a guide and compass in the life of the hotel. DeskBell automatically determines the hotel, in which the tourist is located and provides accessible information, making the stay more comfortable and active. DeskBell Service includes several ready-made technological solutions. Deskbell Chain project is managed by Constanta Investments, a company registered in Estonia, Northern Europe has partnered with a local Papua New Guinean registered tourism e-marketing company, Howarig Traders. In this partnership, Howarig Traders will implement the project to local SMEs in the tourism sector to have access to the global tourism marketplace. In particular, Howarig Traders is targeting ecotourism businesses as its vision to reduce carbon emissions and support environmental friendly tourism businesses. Pacific Trade and Invest (PTI) through a survey conducted in 2011 established that there was a distinct lack of support for small medium and micro enterprises (SMME) operating in the Pacific Islands tourism sector. Tourism market access for SMEs in Papua New Guinea and other Pacific Island countries is the biggest challenge for the region. Most of these SMEs operate within the ecotourism space. Deskbell Chain, through its partner in PNG and Pacific region will bring to the local SMEs the global tourism marketplace.